← Allentown, Pennsylvania. 30th July, 2012. Springfield, Missouri. 7th August, 2012. The hole in front of Brett Craft’s house keeps getting bigger. A sinkhole was found at about noon Monday in the road in front of his home on Farm Road 105 near the Springfield-Branson National Airport. Originally, it was about six feet deep, Craft said. Road repair crews arrived at about 1 p.m. Monday. 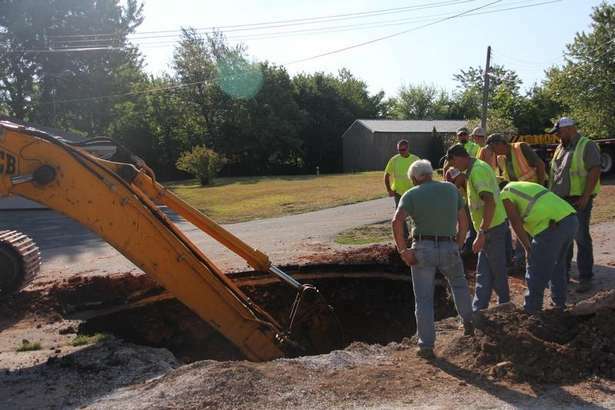 Tuesday morning, Greene County Highway Department crews were digging out the sinkhole, trying to get to the bottom of the hole that developed at the end of the dead-end residential street. Workers are trying to find solid rock, Ritchie Keller, the crew leader on site, said. Once the loose clay has been removed, workers will be able to begin filling in the hole rock, which is more stable, Keller said. Crews had not yet reached the bottom as of mid-morning, Keller said, as workers peered over the edge. He estimated the depth at about 20-24 feet and 10-12 feet across. “They’re pretty common. Greene County has a lot of sinkholes in it,” Keller said. The Highway Department responds to about half a dozen a year, Keller said. He said the current hole was becoming one of the bigger ones they see. This entry was posted in Pictures and tagged Missouri, sinkhole, Springfield. Bookmark the permalink.